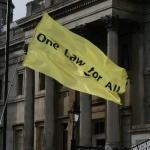 Goranka Gudelj and Yassi Atasheen speak on the One Law for All Campaign. If we lived in any other country we would be governed by the law of that land and therefore if you live in the U.K.you should live by the rules of the land. No faith or religion should be allowed to overturn the law that was placed here by the government. If we allow Sharia law to co-exist with our own laws how long will it be until our laws are disregarded and the law we are governed by will be ONE law SHARIA LAW! 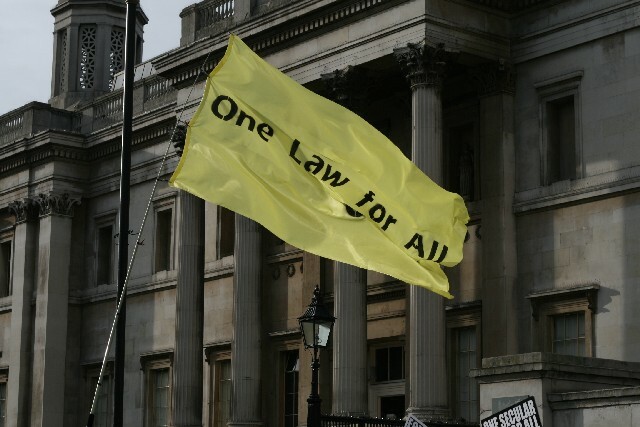 No Muslim country would accept this total overthrowing of their laws( and that is where it will go) and I sincerely pray that the UNITED KINGDOM will not bow the knee to this outrageous demand. hey UK is your country… so it is your freedom..immigrants are foreigners….if they don’t like laws of UK they should return to their country….why don’t they force to implement shariah law in INDIA….think about that???? Do not talk about this simple matters…. UK should oppose this outrageous demand because before long muslims would want another laws. And if you look at the websites of ex-muslims (www.ex-muslim.org.uk) they are strongly against that. Also the refugees from Iran or Syria (who knows what threat to human freedom and fundamental rights sharia is) are in majority against this. UK should be the leader of civiliaztion and guradian of humanr ights, not an Islamic state.